In a nursing or care home environment, the safety and comfort of the client must always come first, and for some the risk of falling out of bed is a very real problem. The Medley Ergo Low Profiling Bed helps alleviate this fear as the mattress platform is much closer to the floor than standard beds. With the addition of the Invacare Medley Ergo Low Crash Mattress, the impact of falls will be fully protected against, as the patient will have a soft surface to cushion any falls. This mattress attaches easily to the Medley Ergo Low, providing a soft surface that will prevent injury in the event of a patient fall. 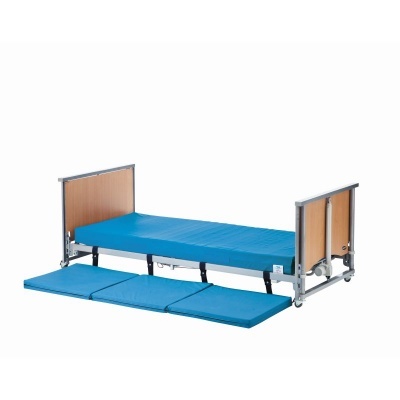 With this mattress lining the floor and protecting the user, elderly and vulnerable patients can be comforted by knowing they are fully protected. Foldable and easy to store when not required, the crash mattress can be attached to the bed to ensure it does not move and is always in the correct position when needed. The mattress is a cost-effective, simple and space-saving solution to patient falls in a care environment.